You may know this by now; I love old rusty bits of metal and getting a haul from the trash pile really gets my imagination fired up. On my day trip up the North Fork of the Granby River, there were so many cool bits of salvage that it's going to take a while to inspect them and figure out what to use them for. You can see more of my road trip and the treasures I brought back on the Junking in July page. I got several brake parts - they are hard for me to resist because, well, they're round, and they also have some interesting textures. 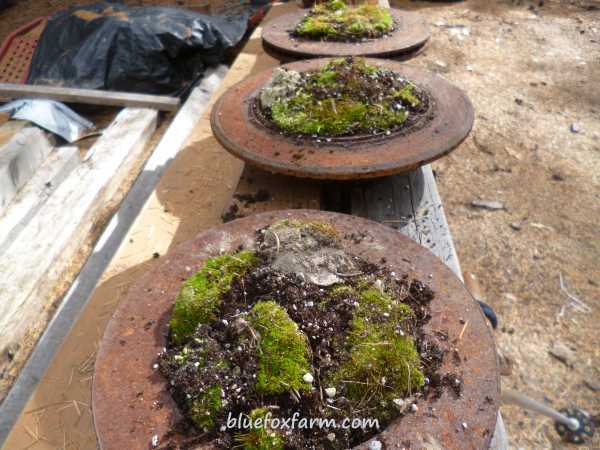 These shallow planters in the making are the disc part of the brake, crucial to stop your vehicle. In the garden, they'll stop traffic - most times because people can't figure out what they are. 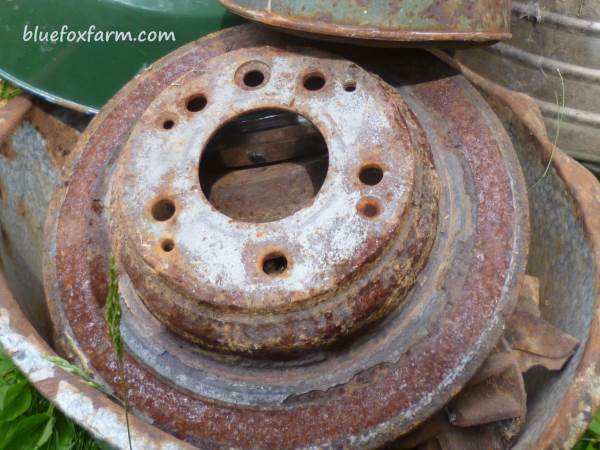 If you have some old brake parts like this, rusty and weathered, you don't need to feel bad about using them for garden art - their days of stopping vehicles are done. 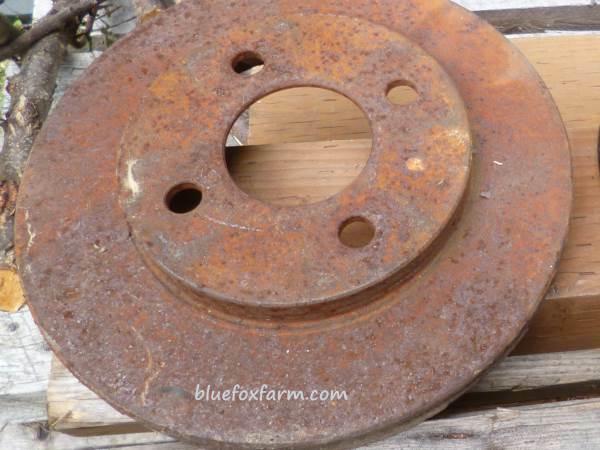 Either of these brake parts will work for a planter - the drum is deeper, and the disc is more challenging. I can see a grouping of these displayed together for more impact. But what about the giant holes in them? Not to worry, I'll show you how to get around that. 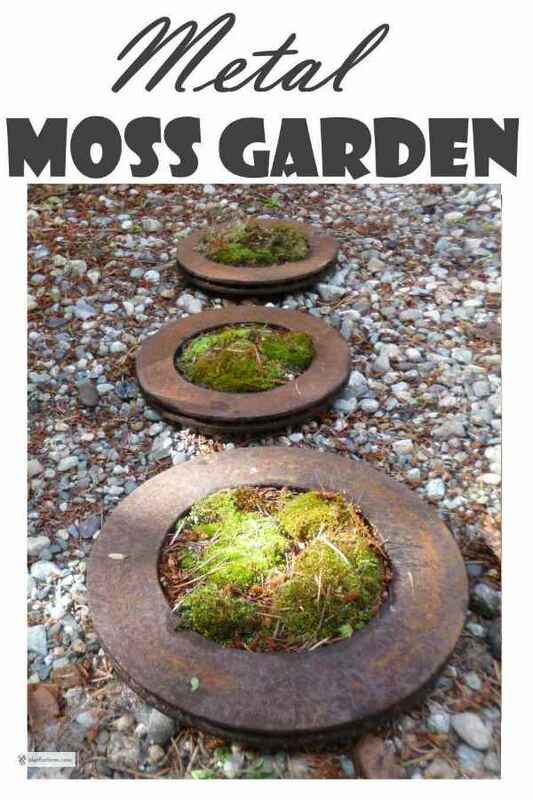 First of all, collect your moss. 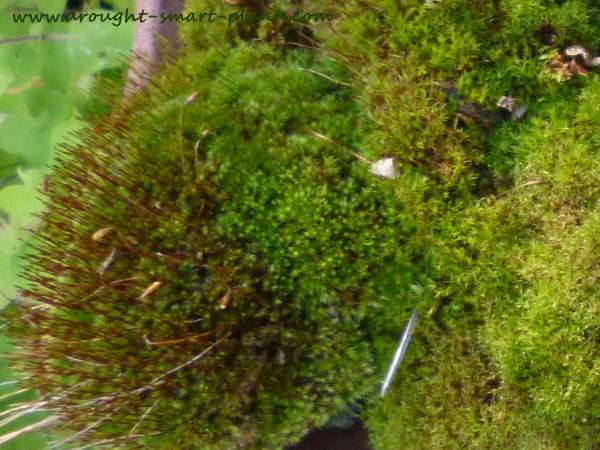 If you're lucky and live in the woods like me, you'll have your favorite cool and damp spots where moss accumulates. The kind to look for is puffy and solid in texture, not the kind that grows in your lawn and chokes out the grass. So, about the holes in your rusty metal thing; Look for some kind of mesh, like hardware cloth which is stiff metal wire woven together or welded into a sturdy mesh. You'll need good side cutters to get through it. I sometimes use some plastic mesh for this, which is easy to cut with scissors. I think this is meant for soffits when constructing houses, so find it in lumber yards and hardware stores - it comes in a roll about six inches wide. Cut your mesh to approximately the size if the space you want to cover. I generally err on the side of a bit too big, because then the friction holds it in place. If the holes are still too big, line it with a piece of landscape fabric to prevent soil from falling through. Other ways of achieving the same thing are even simpler; just use a tin can lid or plastic lid off a yogurt container. 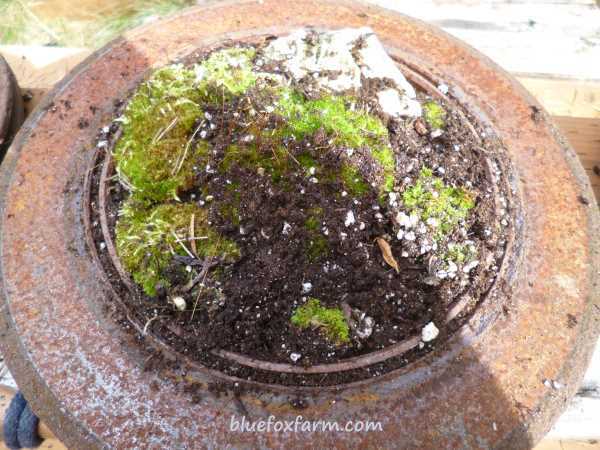 Moss has some preferences when it comes to soil; I usually use the native silty soil where it grows naturally, but I've also noticed that it really likes my old potting soil so my laziness really comes in handy - there are lots of pots in the nursery where the plant died, leaving the way clear for the moss to take over. 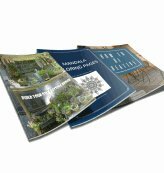 See where it prefers to grow in your garden and try to give it the same conditions - under a dripping eave, or in the shade of deciduous trees are its favorite places in my garden. I'm also partial to rocks - I keep finding some small ones that look like sandstone, weathered into patterns with pockmarks and holes. 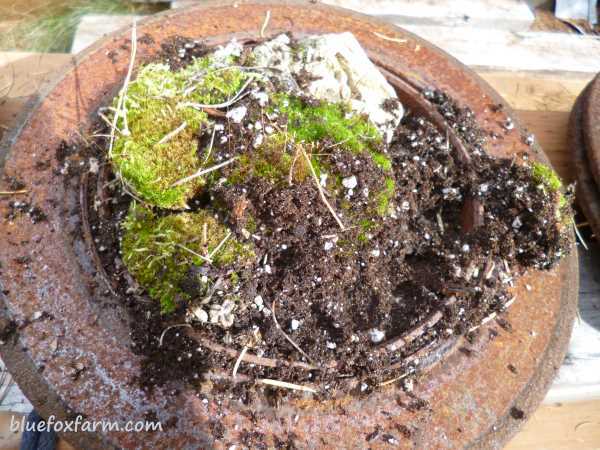 Sometimes I even get a headstart - some of them have moss growing in the crannies already. 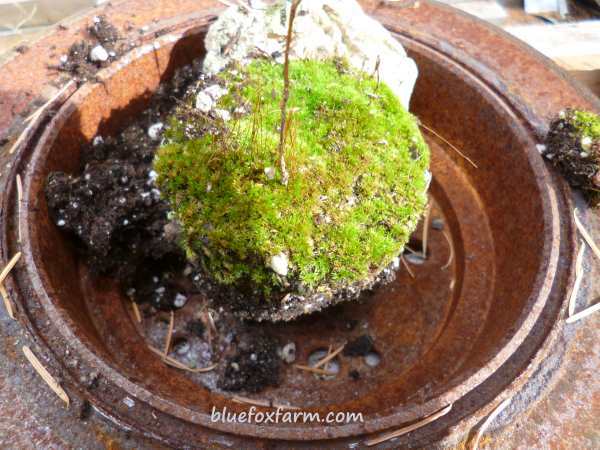 Just so you know, it can take a while for the moss to get established, even up to a couple of years - don't be too quick to give up on it. These could well be the kinds of tiny gardens that just keep getting better and better.